Hex: Shards of Fate is free to play trading card game where players must build up their own deck of cards from a variety of different monsters, actions and spells and go head-to-head against challenging AI in duels or an extensive PvE campaign mode or challenge other players in one-on-one or in exciting tournaments with real prizes. The game mixes elements of classic MMORPGs in with the traditional core TCG gameplay to bring a new and dynamic game to this popular genre. In Hex players face off against AI or other player combatants in one-on-one duels where each opponent’s has their own hero character and a deck of cards made up from various Troops, Artefacts, Constants and Actions that they must take turns in playing with the goal of reducing the enemy hero’s hit points. Cards are able to attack and defend their respective heroes, spells are able to deal damage and debuffs to any troops that have been played or buff their own troops, as well as a wide variety of other options. The Ardent - made up of the Elves, Humans, Orcs and Coyotle they are made up of the races that live above the surface of the world of Entrath, United against the underworld incursion that happened 300 years ago. The Underworld - comprising of the Dwarves, Necrotic, Shin’hare and the Vennen, these subterranean races of the world joined together at the arrival of Hex, the gems that are scattered across the world waking the first of the Necrotic performed this unlikely alliance with the other races. each card in Hex has a number of different values on it depending on what type of card it is, typically accompanied by a “cost” that determines how a resources a player needs to use up to put this card into play as well as a Threshold value; the number of coloured crystals that must have been played from a threshold card before this card can be used. Resource - resource cards allow players to increase their threshold and charge points, resource cards can be made up of different thresholds/crystals with each champion relying on a different typePlayers must collect different cards and build up their deck with what they have available, during the game cards are randomly drawn from the complete deck and so players must use strategy to work out what types of plays they can make depending on the combination of cards they are likely to draw. Each card has a double back, where players can flip the card to reveal extra information on the card, however given the digital nature of the game players can also flip the card once more to reveal a double back where they can see all the unique achievements and statistics of that individual card on how it has been used. Players are able to level up their own cards by filling up its experience, such as by dealing a set amount of damage to reach the next level, at which point players evolve the card into a foil version, which changes the look of the card. Cards can evolve completely and become different types of cards, improving the quality, rarity and abilities of that particular card. 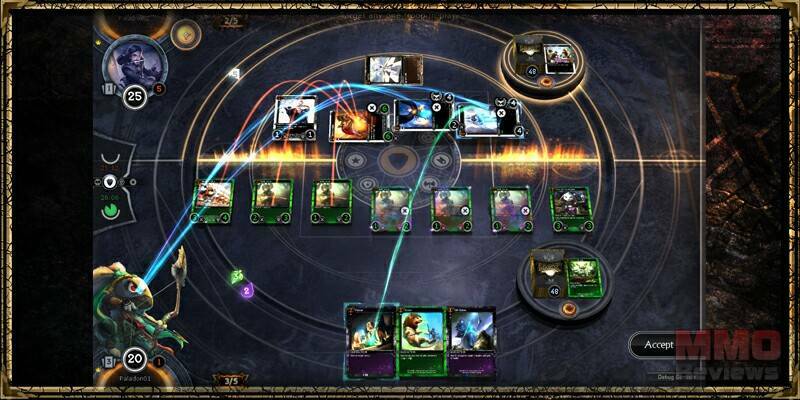 Up of the unique game features of hex is the chaining feature where players go through various phases during a round of combat where they are able to attack and counter-attack each other’s plays before they happen. For example if a player has a Troop with two health already in play and the enemy plays and action card that can deal to damage to it, this destroying it, the player (if possible) could play an action card that’s buffs that Troop for two health. Once each player can no longer respond the turn occurs with the last card added to the chain to be played first and so the Troop would be buffed first bringing its health up to 4 hit points before the two damage was inflicted and saw the Troop would still remain on the field due to a successful counter by the player.